CITE AS: Flo Laino, "The Abbey of the Minoresses of St. Clare," in 100 Minories, March 23, 2015, https://100minories.lparchaeology.com/the-abbey-of-the-minoresses-of-st-clare/ [Date Accessed: April 23, 2019]. 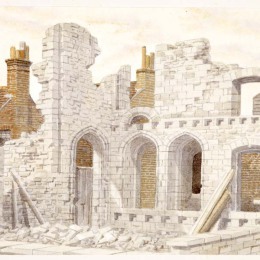 The ruins of the Abbey of St. Clare, Minories. A view by T. J. Smith published in 1797. ‘Remains of the Convent of St. Clare, 1797′, as imagined by James Lawson Stuart in 1890. Minories joins the likes of Elephant & Castle and Poultry as one of the more peculiar street names in London. The Minories in fact gets its name from an Abbey that once stood further north up the road, called the Abbey of the Minoresses of St. Mary of the Order of St. Clare. The term Minoresses, is derived from the Latin ‘Sorores Minores’, meaning Sisters of the Minor Order of St. Francis, an off-shoot of a Fransiscan monastic order founded by St. Clara of Assisi. The Franciscan Order believed that true holiness was achieved by severance from the rest of society, and through absolute poverty, celibacy, and self-mortification. Saint Clara was the eldest daugher of Faverino Sciffo, a Knight of Assisi nobility, a fabled great beauty who ran away from her parents, who trying to force her betroval at a young age, to join St. Francis at the Chapel of Portincula. Receiving her as penitant, Francis cut off her hair and clothed her in plain sackcloth. Clara, went on to established her own Order in 1212, which like Francis’s, upheld the strictest of austerities. The Abbey in Minories was established in 1293 by Edmund ‘Crouchback’ (Earl and brother to Edward I) to house Nuns that his wife, Blanche Queen of Navarre had brought over from Spain. Very little is known about the Minoresses who lived in the Abbey next to Tower Hill, although we could imagine that in being established only 80 years or so after original order in Assisi, the Sisters of the Minories would have gone about their daily lives in a very similar manner to that of St. Clara’s strict devotion. However, it seems that by 1539 when the Abbey was surrendered to Henry the VIII, the Minoresses landholding had like many other religious houses of the time grown wealthy, through the renting of their lands, through exemption from taxation, and through the plentiful bequests that had became commonplace with the rise of doctrine of purgatory through the Western Church in the Medieval period. After their surrender, the Abbey landholdings passed into the hands of the nobility. First, John Clark, Bishop of Bath and Wells, Henry’s ambassador to the Duke of Cleve, and also notably later gifted from Edward VI to Henry, Duke of Suffolk and father of Lady Jane Grey. Stowe, writing in 1598 describes the Abbey Preccinct as being used as armouries and coachhouses. 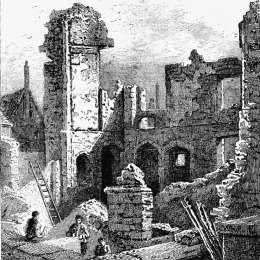 A few engravings by T. J. Smith, depict the last remaining ruins of the Abbey after a fire in 1796. No remains of the Abbey survive today. British History Online. ‘The Minoresses Without Aldgate’: http://www.british-history.ac.uk/report.aspx?compid=35371 [Accessed 20 March 2015]. British History Online. ‘Aldgate, the Minories and Crutched Friars’ Available online at: http://www.british-history.ac.uk/old-new-london/vol2/pp245-250 [Accessed 20 March 2015]. Stewart, J. L. (c.1890). ‘Remains of the Convent of St. Clare, 1797.’ [Watercolor]. Available online at: http://collections.museumoflondon.org.uk/Online/object.aspx?objectID=object-96270&start=32&rows=1 [Accessed 23 March 2015]. Simone Martini (1285–1344). Freskenzyklus Szenen aus dem Leben des Hl. Martin von Tours in der Martinskapelle in der Unterkirche der Basilika San Francesco in Assisi; Szene: Heilige, Detail: Hl. Klara.